Well what can i say its been a dream of mine for a while now to travel new zealand in a camper van and i am living out that dream right now. We arrived in New Zealand on the 20th in the early hours and already i am in awe of this magnificent place and its ever changing landscape. We touched down in Christchurch and the next day headed straight to the information centre to find out what the cheapest options were for getting around, we decided to go for the camper for 12 days to do the north island and a car for the rest of our trip to travel the south. We were quite lucky with our camper too as the owner Randall had run out of the cheapest model so gave us the next one up for the same price and its ace. Its a toyota and i dont know the model but it has roadrunner on the side and i have named him Ronnie. We set off from Christchurch that day after booking our next month in NZ and with a van full of food and booze we headed north. Our first stop on the way was Kaikoura. What a beautiful place. The scenery on the way here blew my mind and i felt honoured (seriously)to be driving through it. When we arrived we parked up at the side of the road and headed to the Local bar which was called the Strawberry tree. Suprisingly an Irish bar (they are pretty big out here) but this one was full off pissed up Irish and the Quiz master was an utter joke some of his comments i have put in my journal as my top quotes from New Zealand. An example being a clue to a film question he had asked "the name of the film is the same as the actors name" later we discovered the answer was Robocop. I have never laughed so much at a pub quiz in my life. The next day we headed to Picton where we jumped straight on the ferry to Wellington. After driving for several hours while Rob had a wee nap i decided to make the most of the three hour journey and went to sleep. We stayed in wellington for one night and went for a few drinks again parking up at the side of the road. Wellington is a pretty place but everyone seemed fitness mad i have never seen so many people running at tea time in my life i was like go home and have your bloody tea! We both did pay to go swimming while we were there though but this was to make use of the showers neither of us actually had a dip! LOL! The drive from Wellington to Napier was amazing it took about 5 hours as it rained pretty bad most of the way but it was still enjoyable and the rain made it more of a white nuckle ride. We were bending and turning for miles through mountains, forests, lakes and fields. It was like nothing i have ever seen, its no wonder so many films are made here its magical. I really cant do it justice in words you will have to check the pics out when i finally manage to get them on. We stayed in Napier for one night also and headed for drinks again that night to an irish bar (the only bars with ppl in)and found a nice spot to camp by the sea (at the side of the road) where we woke up to egg on our poor Ronnie! i dont know what we did to pis ppl offthink its just cos we are travellers! Napier has lots of art decor and is pretty funky they rebuilt it all after a pretty montorous earthquake. Apparently in Feb everyone drives round in cars from the 40's and 50's and gets dressed for a big festival they have here. While in Napier we did a wine tasting tour which was pretty average and wasnt what i was expecting but still we had a laugh (i slept for about two hours after) We also checked this place out called Opossum world which can only be described as something out of the league of Gentlemen (there were stuffed possums playing the bloody Violin) Anyways after a fun filled booze up with the Possums i then slept off the full glass of wine we tasted that was spread out into 6 glases (we though whe it said 6 glasses we got full glasses) we headed north again. Next stop was Taupo. We got here pretty late on again so found a camp site near Huka falls called Reiss Farm it was free and they had toilets so we parked up for the night had a few beers and a few games of Yahzee. The next day was jam packed. We visited the Huka Falls, the Craters of the moon, which are natural hot springs with steam coming out of them, we then went went to see some Rapid action but couldnt afford to actually do the trip, then went Prawn Fishing for an hour and half where i coaght one whole Prawn (rob caught nothing) the most expensive prawn i have ever eaten in my life! You basically can keep what you catch but you pay to fishing! Then we headed to try some honey at a honey farm and stayed on Reiss Farm again where we met a a nice couple who the next took us to some springs where you could bath in the water! I kid you not in parts they were red hot as much as 40 degrees but we got to have a nice bath which was pretty cool. 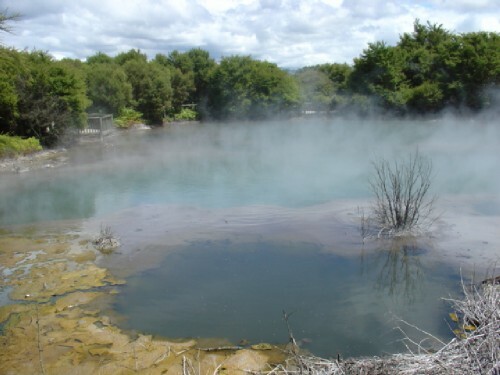 Anyways we have headed further north now and are in Rotorua! It smells of eggs here because of the sulphur (its preety gross) but we will check out what it has to offer tomorrow and keep you posted.